San Jose, CA – Dishcrawl, popular for providing local food adventures, will be hosting a sneak preview to the annual Dine Downtown event. 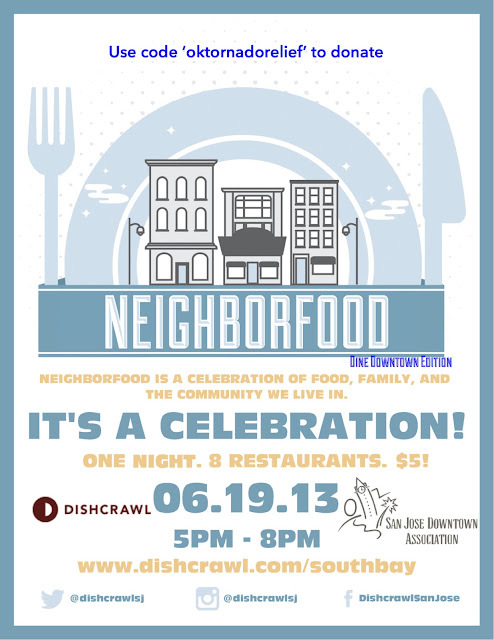 Join us in downtown San Jose on Wednesday, June 19th from 5-8pm, we invite you to engage your taste buds as we explore the many special offerings of our local favorites two days early. “With participating locations like Fahrenheit and Billy Berk’s, Dine Downtown is sure to be a successful restaurant week and Dishcrawl is giving people a VIP exclusive,” says Kirby Ptacek, Dishcrawl ambassador. With the destination set at serving quality dining experiences, the San Jose Downtown Association seeks to highlight the quality and diversity of dining options in downtown San Jose. This year, Dishcrawl will feature 8 of the participating Dine Downtown venues and dish out a unique and memorable way for people to connect over food. A ticket grants entry to the event, a cupcake, and the chance to win up to $500 of prizes courtesy of the San Jose Downtown Association. Tickets for menu offerings will be available for purchase on day of event. Entry tickets are $5 and now available for purchase here.